If this setting is not activated, no sender will be shown in the mobile app. If this setting is activated, a sender can be defined. Uses the logged-in user who triggers the Push notification action. Displays the path and name of the selected user from the User Manager. Opens a dialog where a user can be selected. A data field which contains the sender data can be selected here. String data fields must contain user GUIDs, container GUIDs or set GUIDs. If the field, for example, contains the GUID of a user group, every user, who is a member of the user group, will be used as the sender. Integer data fields must contain user IDs. 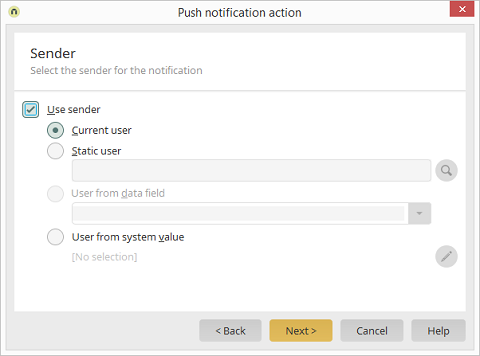 The generated push notification contains the GUID and qualified login name (combination of login name and domain) of the user. With this option, a system value, which provides a user, can be used. The currently selected system value type is shown here.